Baldness now a day is no more serious cosmetic problem as Dr.Ahmad Chaudhry has introduced Fue hair transplant in Lahore for the last many years. It is a most advanced and latest procedure for hair loss treatment , free from pain, discomfort and incision. Baldness is a problem that almost everyone suffer and getting hair transplant in Lahore to restore hair is a best option. While some people experience less hair fall, there are many reasons why people suffer severe loss at any age, especially after puberty. It may be inherited but there are many diseases that cause baldness as well. Normally, an individual loses around 100 strands but in case a person has gone through an illness or was bed ridden due to an infection. What really happens is that while a person suffers from some illness and is taking medication, the hair goes into a resting phase and does not fall at the daily 100-strand average that it should. Right after the illness passes, hair thinning and been in the resting phase during illness along with the daily shedding, couple up and fall together. This makes the number of hair coming off daily more than the usual and it gives an impact that one is having baldness. This kind of shedding is temporary and may be recovered once the illness has totally passed out. Many diseases are commonly found that cause partial or complete baldness, such as alopecia. Alopecia has a few types, such as androgenetic alopecia or male / female pattern baldness, alopecia areata and scarring alopecia. The androgenetic alopecia is caused by the genetic make-up that reduces the hair type, texture, natural pattern and the life of a hair strand. In some people the life of an individual strand is lesser than the average age for the certain age group or ethnicity that the person belongs to. Apart from this, It is triggered by deficiencies and crash diets that cause a reduction in the amount of nutrients consumed and hence the amount of nourishment that receive is reduced or nullified and cause the hair to become lifeless and wither off. These disorders can be eliminated by taking good supplements that effect the hair growth process and to recover. Our clinic is a famous for best quality results via hair transplant in Lahore and people come all over Pakistan and abroad for treatment. Alopecia has received attention from medical science and researchers and scientists have formulated medicines and procedures to overcome this cosmetic problem. Medications include popular names such as Minoxidil and propecia which cause removal of hormonal compositions that hinder growth. Apart from this, surgical methods and laser treatment are also available for people undergoing serious problem. Hair restoration is a successful surgical procedure that ensures coverage of bald patches for a long time. It is done in two main ways; Strip harvesting and Follicular Unit Extraction (FUE). The procedure of hair transplant is decided by the surgeon after examination of the condition, its causes and effects. It is advisable for every patient to first focus on the cause. In case it is caused by any illness, it is best to recover from it totally and then seek treatment otherwise the existent illness or disorder will cause baldness to occur again. 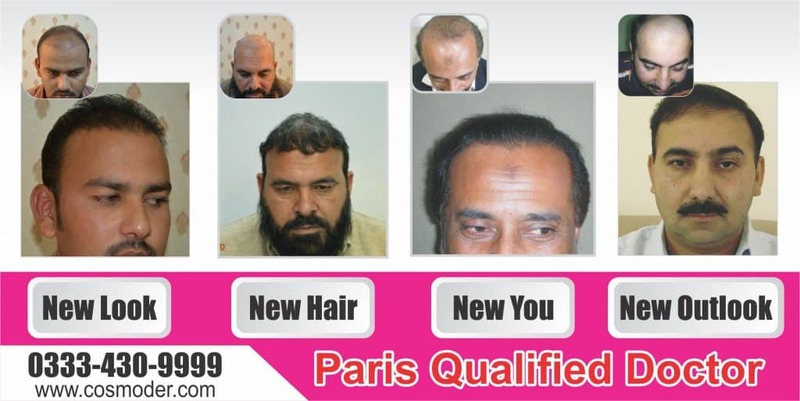 There are new and latest laser therapy,platelet rich plasma treatment, Scar free and stitch less Fue hair transplant in Pakistan Lahore to cure and restore hair loss in Lahore. Hello Anmol , We can perform Vitiligo surgery only if it is stable and not progressive in nature. hi i have a baldness on my skin few parts of it alopecia i want to get it done kindly advise..
Hello, hair loss or baldness is a common among male patients. Most common type of baldness is hereditary called Androgenetic Alopecia.As there are many types of baldness so it is important to know cause and proper diagnosis before any treatment.You can send your close up photos of bald area from different angles through whats app or email so that we can help you. Hello Amina, Skin whitening injection will cost you 8000 rs per treatment and it needs 8 to 11 injections, once per week. Hello Ali, We already sent you detail information regarding fue hair transplant procedure and its price at our clinic in Lahore. Please check your email. © All Rights Reserved. Dr.Ahmad Laser clinic Lahore.